Amy Hepworth’s life’s passion is feeding people. Back in 1982, Cornell University degree in pomology fresh in hand, she took the reins of Hepworth Farms, a nearly 200-year-old apple farm in New York’s Hudson Valley, and changed everything. Crop diversification was only part of a larger transition to sustainability. Some said it was economic suicide, others heroism. There were some lean years, but steadfast believers – among them the buyers of Brooklyn’s Park Slope Food Co-op – hung in there and so did the seventh-generation farmer. And just this month, the Cornell Alliance for Science has named Hepworth its Farmer of the Year. 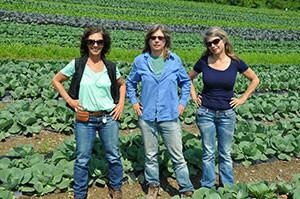 Today, Hepworth Farms produces over 400 varieties of certified organic vegetables on 400 acres of NOFA-certified land. Yet Hepworth, whose studies in ag science were just getting started with her B.A. in pomology, has some serious concerns about anointing the “organic” label as the be-all, end-all of healthy eating and about hard-line opposition to genetic modification of crops. We spoke to Hepworth about her vision of a third way. Seedstock: So what are your major concerns right now? Amy Hepworth: I’m about to dive into intensive research on microbiology this winter. And I’m very concerned with the anti-GMO movement – the way information is being disseminated, the way the conversation is framed. I went on vacation with friends recently and they refused to even discuss the issue. SS: What were they afraid of hearing? AH: Nature is remarkable; understanding nature’s intrinsic wisdom is most important. But people don’t even know what natural is at this point. The whole concept of feeding ourselves on the scale that must happen today is very unnatural. The information that is out there is mostly not science-based, it’s opinion. And most of it is not coming from the one percent of people who are actually involved in agriculture. There’s a big disconnect, and people without knowledge are carrying the conversation. We can’t blindly commit to one way of thinking. We need to be open-minded about how to be sustainable, be responsible stewards of the soil, and feed people in 2050. SS: So you feel like there is too much negativity? AH: The organic movement should accept the fact that not all non-organic technique is bad. First of all, it’s always better to eat the fruits and vegetables than not to eat them. People don’t realize that “conventional” and “industrial” agriculture aren’t the same thing. Bottom line, all farmers want good, healthy soil and integrated pest management. A blend of organic and non-organic tactics can get you there. Saying GMOs and pesticides are “unregulated” is ridiculous; they’re tightly regulated. Safer ones and new biological options get approved much faster, so there is an economic advantage for the companies in making them as safe as possible. And these regulations are decided in terms of parts per billion, not even parts per million. SS: This is an interesting point of view for someone who does a lot of organic farming. AH: I’ve been focused on de-chemicalization since the 1970s; it doesn’t happen overnight. How did we get here? Because consumers wanted the perfect shiny apple, the longer shelf life, things that don’t exist in nature. The real goal has to be to feed everyone and do it in the least negative way possible. Biotechnology is still very challenging and expensive, but very promising. What s most important is applied research; meanwhile, the land grant universities have been radically defunded. We need an agricultural system that is environmentally sound, economically viable and socially just. If you stay within those three things, you can build a strong, secure system where everybody gets to eat fresh fruits and veggies. If you find one little flaw and focus on it and yell at each other about it, we’ll never get there – and in 2050, we’ll have 9.5 billion people to feed. We can talk about the industrial revolution and its wars and chemicals, but it was also about trying to feed people, and just because things went wrong doesn’t mean we should ignore what went right. It’s a complicated world we’re living in; course corrections are needed. Nature has them too. If I could just influence food systems activists to focus on a third way, and on making the conversation a more positive one, that would be great. When you take a bacteria-resistant gene from a tomato and put it in a delicious Brandywine, your body does not experience that as anything but a tomato. We have been manipulating genetics since the beginning of cultivation; we now have a fantastic tool that can do in months what used to take years. The organic movement is wonderful. It got us off the worst chemicals, and we’ve never gone back. Right now we have the most abundant and safest food supply in human history. We need to continue to employ applied science to improve and heal and protect both the environment and the humans. And extremism, holding a rigid position, is not what will get us there.